Deciding to participate in the town’s Easter Open Studio weekend has been interesting – and it is only the first of the four days that I am ‘open’. 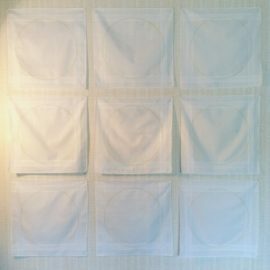 I spent the last week installing my own work throughout my apartment. Play and Odyssey (which I put up almost as soon as I moved in) have been joined by three other pieces in the living room. Some of the ‘curatorial’ decisions were made for purely practical reasons, and as a result some are more successful than others. When initially thinking through what I might like to show I had conveniently forgotten that the majority of the walls are concrete skimmed with no more than four millimetres of plaster – I am very thankful that I have the long-term loan of a SDS drill. Even so it meant that a piece that is pinned to the wall necessarily had to be placed over the bed on the one plasterboard wall in the room. The placement works really well – probably far better than the one that I had had in mind. 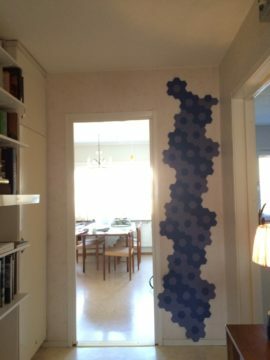 A large irregular shaped patchwork that is also pinned to a wall could had to be relocated to the hall/library where the only other plaster wall is found. It works well there but left an uncomfortable gap in the living room. Selecting catalogues and publication for the library shelf reminded me of a piece that I had overlooked, that piece now hangs in the living room where I had imagined that the patchwork would be. 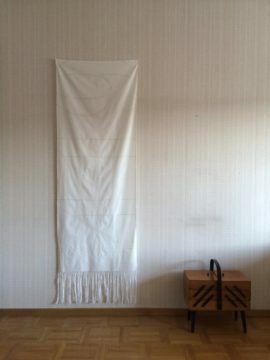 However it is the placement of that ‘substitute’ piece that I am not one hundred percent happy with – materially and tonally it is very similar to the nine embroidered handkerchiefs hanging over the bed. 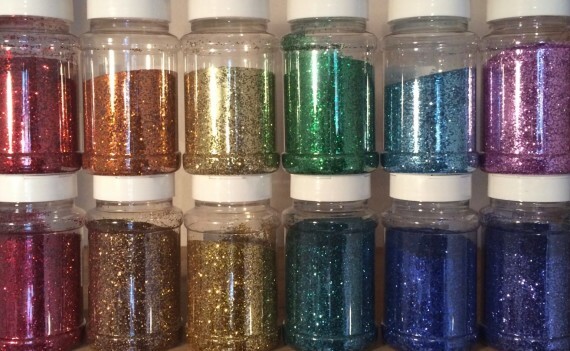 As a result the living room has become a room of two halves – one half being white and gold textile pieces, the other being black glitter works. Play which is black and glittery hangs in between. The curation is neither wrong nor too bad, but is it a little too easy and I would like it be a little more dynamic.